Above image: Construction is expected to be finished in 18 to 24 months. 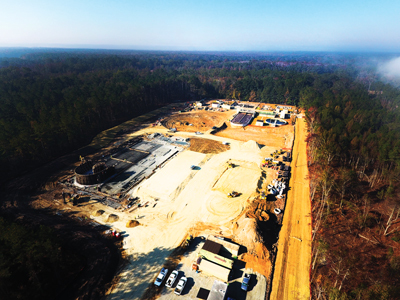 Owned and operated by the Beaufort-Jasper Water & Sewer Authority (BJWSA), the Hardeeville (S.C.) Water Reclamation Facility is in the midst of a major upgrade, driven by area expansion and environmental responsibility. Built in the 1970s by the city of Hardeeville, the plant—along with the water and sewer system—was purchased by BJWSA in 2002. The existing plant has a capacity of approximately 1 million gal per day (mgd) and has an oxidation ditch treatment process with limited screening and headworks. The plant sits on a 30-acre site and discharges into the Savannah River, which is the border between South Carolina and Georgia. The plant initially had a secondary treatment limit, but when the river’s total maximum daily load (TMDL) was updated, the plant had to work to improve its treatment processes. “After about a 10-year effort [we] were able to … come up with an appropriate TMDL to meet all the long-term water quality standards in the river,” said Ed Saxon, general manager of BJWSA. These new treatment requirements, combined with anticipated population and business growth, spurred the need for a major expansion. BJWSA recently built an administrative building that earned LEED Silver certification from the U.S. Green Building Council, making it one of the first buildings in the area to receive a LEED designation. It wanted to explore how to bring these sustainable principles to the design and construction of its wastewater treatment plant expansion. The plant expansion will sit adjacent to the existing plant on the 30-acre site. The two-phase project will include construction of an expanded wastewater treatment facility adjacent to the current facility. The first phase of the upgrade will expand treatment capacity to 2.7 mgd, and the second phase will enable a capacity of 4 mgd. The new plant will include a new headworks with mechanical screening and grit removal. 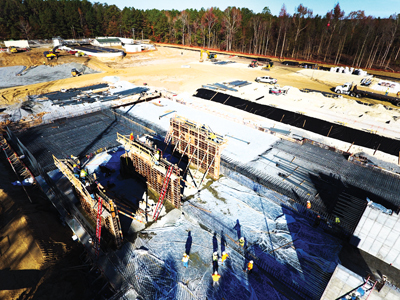 A 1-million-gal equalization tank will be equipped with an energy-efficient Enviromix mixing system, and two oxidation ditches with an anoxic zone will help the plant meet future tertiary treatment standards. The plant also will have secondary clarifiers and a sodium hypochlorite disinfection process. With the help of engineering firm HDR, BJWSA embarked on the Institute for Sustainable Infrastructure’s (ISI) Envision process. The system measures sustainability in five areas: quality of life, leadership, natural world, resource allocation, and climate and risk. “Even though it cost us a little more money to go through that process, we thought our customers [would be] willing to pay that extra expense when we produce a product that’s really going to be truly sustainable [and] in the long-term best interest of the community,” Saxon said. This sustainability extends to the plant’s construction process. BJWSA worked closely with the city of Hardeeville, allowing the city to provide input regarding certain elements of the plant, such as aesthetics and odor control. It also is maintaining a 300-ft forested buffer around the construction site to minimize neighborhood disturbance. Storm water and sediment and erosion control measures have been implemented to further ensure environmental responsibility throughout construction. “We went down [the Envision] path, which involved a lot of effort by a lot of staff members and engineers and even our contractors to make sure that the plant is designed in accordance with the Envision concepts,” Saxon said. That effort seems to be paying off. ISI recognized BJWSA for its sustainability efforts in design and construction of the plant, noting its high marks in the leadership, quality of life and natural world categories. The first phase of the expansion began in October 2016 and currently is about 10% complete. Saxon said the plant is expected to be up and running in 18 to 24 months. Amy McIntosh is managing editor of W&WD. McIntosh can be reached at [email protected] or 847.391.1025.